AUDIO:	The most common form of cancer in the eye can be deadly. New treatments have allowed doctors to preserve vision in patients with ocular melanoma, but sometimes the cancer... Click here for more information. Researchers at Washington University School of Medicine in St. Louis have developed a genetic test that can accurately predict whether the most common form of eye cancer will spread to other parts of the body, particularly the liver. In 459 patients with ocular melanoma at 12 centers in the United States and Canada, the researchers found the test could successfully classify tumors more than 97 percent of the time. The study will appear in an upcoming issue of the journal Ophthalmology, but is now online. "When the cancer spreads beyond the eye, it's unlikely any therapy is going to be effective," says principal investigator J. William Harbour, MD. "But it's very possible that we can develop treatments to slow the growth of metastatic tumors. The real importance of this test is that by identifying the type of tumor a patient has, we can first remove the tumor from the eye with surgery or radiation and then get those individuals at high risk into clinical trials that might be able to help them live longer." Harbour believes the test should allow ocular oncologists to quickly evaluate the risks associated with particular tumors and to begin treatment the moment they can detect any spread of the cancer. Melanoma of the eye is relatively rare, diagnosed in about 2,000 people in the United States each year. Advances in treatment have allowed surgeons to preserve patients' vision, but when cancer spreads beyond the eye, it often is deadly. About a decade ago, Harbour, the Paul A. Cibis Distinguished Professor of Ophthalmology and Visual Sciences, began using gene expression profiling to monitor the activity of thousands of genes in and around ocular melanoma tumors. "At the time, we were surprised to see that based on these gene expression profiles, the tumors clustered into two groups that corresponded, almost perfectly, to patients whose cancer spread and those whose cancer was confined within the eye," says Harbour, who directs Washington University's Center for Ocular Oncology. "Tumors with a class 1 gene expression profile, or 'signature,' very rarely spread, but those with a class 2 profile frequently develop into metastatic cancer." Initially, Harbour's group identified differences in approximately 1,000 genes between class 1 and class 2 tumors, but they whittled down that number, hoping to develop a simple test that could be used easily by ophthalmologists. Eventually, they settled on about a dozen genes that could be evaluated in tumor samples collected with a needle biopsy. "We went through a number of sophisticated algorithms and validations, and we came up with a group of 12 genes," he says. "We also included three more genes that don't change whether they are in tumor tissue or healthy tissue. Those genes act as our 'controls' in this prognostic test." 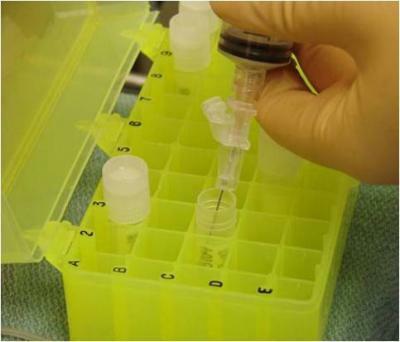 Using very small amounts of tumor tissue collected by a needle biopsy, doctors can conduct gene expression profile testing to determine the likelihood that an ocular melanoma tumor will spread beyond the eye. Testing tumor tissue from his own ocular melanoma patients at the Alvin J. Siteman Cancer Center at Barnes-Jewish Hospital and Washington University in St. Louis, Harbour found that the gene expression profile test was very good at identifying the two classes of tumors. Then he started recruiting other centers to test the method, too. "It doesn't make for a good test if it works really well for us, but it doesn't really work for anybody else," Harbour says. Doctors at the other centers collected tumor samples and shipped them to Harbour's lab. Not knowing anything about which tumor samples came from which patients, the lab then analyzed the samples and made predictions about which tumors were likely to spread. Although it can take up to five years before there is any evidence that cancer has spread beyond the eye, this study went back less than two years later and tested predictions against what actually had happened. Almost 62 percent of those tested (276 patients) had class 1 tumors, which were unlikely to spread. About a year and a half after the samples were tested, only three of those tumors had metastasized. Meanwhile, 38 percent of those tested (170 patients) had class 2 tumors, indicating that spread of the cancer was more likely. In that group, 44 (26 percent) developed metastatic disease during the study period. Had patients been followed longer, more likely would have experienced spread of their cancer. Statistical predictions estimate that among class 2 patients, about 60 percent would have metastatic disease within three years, and approximately 80 percent in five years. "In this relatively short study period, the test worked as well as in the larger group of patients as it had in our patients," Harbour says. "That was important because it validated not only that our test was an accurate predictor of which patients will develop metastasis, but it also proved that the test can be performed successfully in most other clinics. At the moment, more than 70 centers around the world are using a commercially available version of the same test." In the past, some centers relied on a chromosome test to identify eye tumors that were likely to spread. That test looked at chromosome 3 because many ocular melanoma tumors have only one copy of that chromosome. But the 15-gene expression profile test is more accurate. It takes a more complete "snapshot" of the entire tumor. Harbour says the results of the chromosome test can change, depending on which part of a tumor gets sampled. "I compare it to how our brains recognize faces," he says. "We don't just focus on somebody's nose. We take in all of the information from the entire face. This test takes information from the entire tumor, so if the 'nose' in the 'picture' is out of focus for some reason, it still can analyze other things." Another strength of the test, he says, is that it can identify which patients will need the closest monitoring. "Here at Washington University, for example, we monitor patients with class 2 tumors every three months and can begin treatment right away if we find evidence that a tumor has spread," he says. On the other hand, the current study found that more than 60 percent of patients with ocular melanoma have class 1 tumors. Those patients don't need to be followed with the same frequency. "We won't have to use high-intensity surveillance on everyone, only on those patients with a class 2 molecular signature, because they're the ones at risk for metastatic cancer," Harbour says.